Your reservation calendar is the most important tool when running a rental business. It helps you keep track of what’s going on with your rental and communicates your availability to prospective guests. When you first log into Tokeet, the first thing you see is your Tokeet Calendar. Once you connect all your channels, you will see your bookings right here. 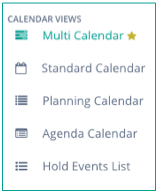 There are different calendar views in Tokeet; you can switch between each view by selecting from the Calendar Views menu on the left hand side. If you have a favorite calendar, you can set it as your Default Calendar by hovering over it and adding a "star" icon to the right. Tokeet Multi Calendar allows you to see all your Rentals on the same screen, and to add events simply by clicking on the calendar. 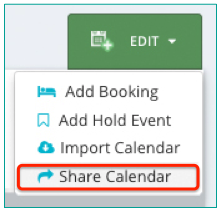 For example, we can add a Booking or a Hold Event by clicking right on the calendar. A Hold Event is a blocked calendar event in Tokeet. Learn more about Hold Events here. On the Multi Calendar, you will see Filters at the top of the screen. Filters allow you to narrow your view by Month, Rental. Channel, etc. Under the Multi Calendar, you will also see an option to adjust how many rentals are shown at one time, by clicking on the number “10” under the calendar. Tokeet Standard Calendar lets you see a Monthly view. Much like the multi calendar, you can add calendar events simply by clicking on the calendar. Tokeet Planning Calendar lets you see the entire Year at a glance. This calendar helps you quickly identify in what month and week your occupancy is at its highest point. Tokeet Agenda Calendar lets you see what’s happening this Week. This calendar shows each day's checkins and checkouts, and is especially useful for your Staff--who will be able to coordinating cleaning around your guests' arrivals and departures. Learn more about giving your Staff users access to Tokeet here. You can send anyone a URL to view the detailed version of your calendar with all the various hold event types. The shared calendar shows key information about the property such as the property name, address, and description. 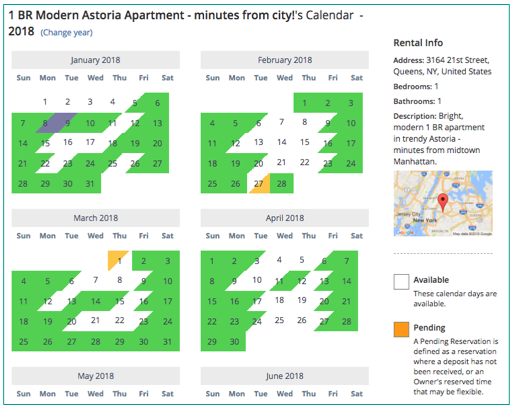 The shared calendar shows which days have confirmed or pending bookings, and days that have been blocked off for personal use or for maintenance. Detailed guest or booking information is not shown when you share the calendar in this manner. 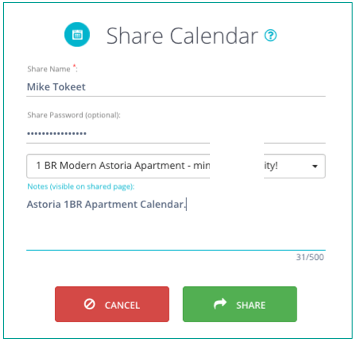 Name your shared calendar and set an optional password. If no password is set then your shared calendar link will be accessible by anyone. Don’t worry, you can always change or reset your password at anytime. You can also add notes that will be displayed on your shared calendar. Click the "Share" button. This will return a URL that you can now send to anyone you like. If you'd like to change password or disable access for your shared calendar link, you can do so at any time, at Settings > Shared Content.